One of my least favorite things about traveling is packing. I worry my suitcase is going to exceed the approved weight limit. If I’m doing carry on, I worry not everything will fit inside my smaller suitcase. I actually have FOMOS, fear of missing outfits and shoes. A girl must look good and be comfortable no matter where her journey leads her. Thankfully, my fear has subsided now that I know how to pack like a pro. How do I accomplish this feat of genius? 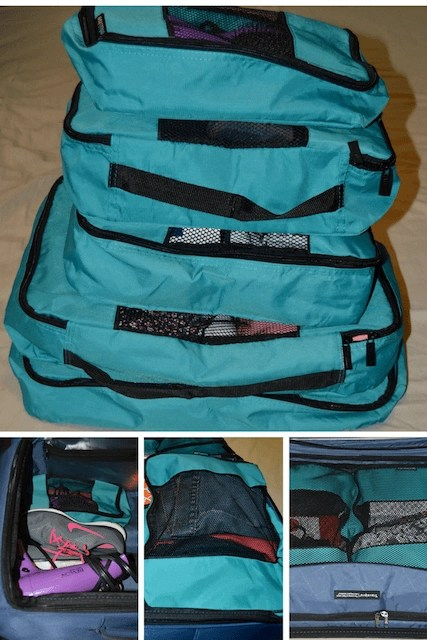 With my new TravelWise Packing Cube System – 5 Piece Weekender Set (available in 5 colors). Made from extra durable, lightweight nylon fabric, TravelWise packing cubes making packing for a short trip or long journey so much easier. Each set comes with five cubes, including one small, two medium, and two large. You can use all five cubes or pick and choose the ones best suited for your trip or suitcase. Get started on how to pack like a pro! I used my teal cubes on a recent weeklong trip to Houston. Since I knew I would be checking my bag and my plans would fluctuate throughout my stay, I decided all five cubes were needed. One of my favorite aspects of the TravelWise Packing Cube System is they force me to pack more efficiently and with more organization. Just one system allows you to pack like a pro! 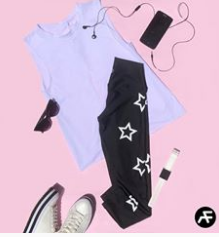 Because I can compartmentalize my clothes, workout gear, underwear, PJs, etc., I can plan my outfits for each day and make sure I don’t forget anything. Not only do my TravelWise Packing Cube System ensure everything I pack stays neatly folded during transit, but they also help me more effectively utilize the space in my suitcase. And because each features a handle, sturdy zippers, and an open mesh design, I always know what’s in each cube and can easily take them in and out of my bag. As you can see by the pictures above and below, I used the smallest cube to hold my brushes and styling tools. It fit neatly in the bottom of my suitcase, allowing me to safely stack my toiletry bag on top, with room left over for shoes. Next, I packed one of the medium sized cubes with my PJs, socks, and workout gear and the other I filled with my underwear, bras and tank tops. Both cubes fit perfectly in the top zipper compartment of my suitcase. See how easy the packing cubes allow me to pack my clothes and shoes? This freed up the entire right side of my suitcase for the two larger cubes. I filled one with my pants, jeans, and a water bottle, and the other with my tops and dresses. Because they are stackable, I was able to neatly tuck one cube at the very bottom of the suitcase, followed by a layer of shoes. I covered the bottom cube and shoes with the remaining cube. Yes, it’s a lot of shoes. I can live with being able to bring fewer clothes, but I need a variety of shoe choices. I know, I have a problem. With my suitcase all packed, I was ready for my trip. It didn’t break the weight restrictions and it arrived, minus my one of my frequent flyer nametags, just as I had packed it. Having my packing cubes made it so much easier to stay organized during my stay as well. Each night I would hang up the outfit I wanted to wear the next day and then replace the cubes back in my suitcase. Because I maintain this system, I don’t have to repack my suitcase at the end of my trip. Tell us what you think of our packing tips! How do you pack for travel? I totally stink at packing, so I am going to try this method for sure. I am THAT person who is cramming things in there and then everything comes out wrinkled. Isnt it amazing what those travel cubes can do for space? 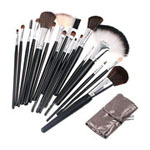 I never thought much of them until I tried them – and that sold me! I haven’t seen these before! And I am a terrible packer so I need these in my life ASAP!! I’m definitely a chuck everything in and hope for the best person usually! I admit I am a pro when packing. But these cases would definitely make my packing more organized so that I know where everything is and can separate dirty from clean when I’m on my way back home . Great tips for our upcoming family vacation to Mexico. I love packing everything nice and tight to get it all in and save room for souvenirs. I always read posts like this and say to myself I can do this, but as a mom of three, it’s impossible. Packing light is no longer an option for me haha. First off, that suitcase is genious! Anyone can pack like a pro with that amazing storage solution! I love all the little packs that go with each other all perfectly fitting into one. I love this! My bags never look that tidy! Mine are always overflowing so I guess that means I need to learn how to pack better! Wow, that’s some awesome packing! The best packing I ever did was going to Disney World, and I put everyones clothes in gallon zip lock bags. It’s awesome to have these especially when you travel a lot. I love keeping my clothes organized so that it’s not difficult to pack and unpack. I love organizers like this because I want to make sure that everything is where it’s supposed to be when I check my things once we arrive. It’s a good way to know that you didn’t forget anything. Packing is not my strong suit. We went on a trip in April and it was so hard for me to make sure things were fitting lol, it was seriously a mess. Where has this been all my life? This is amazing! 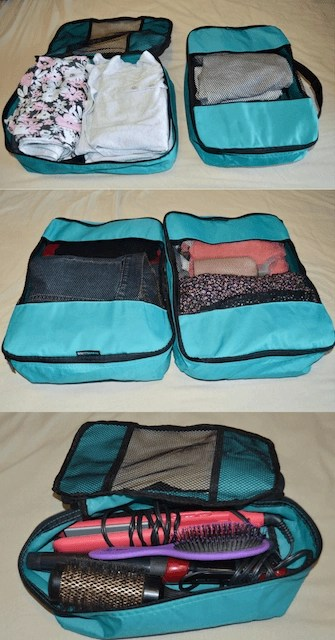 I struggle with packing organization so much but this looks like an awesome solution. Packing cubes are a lifesaver. They make packing so much easier and really save room in the suitcase. I am the WORST packer! I never thought to use packing cubes! That makes so much sense and look how neat and clean everything looks! 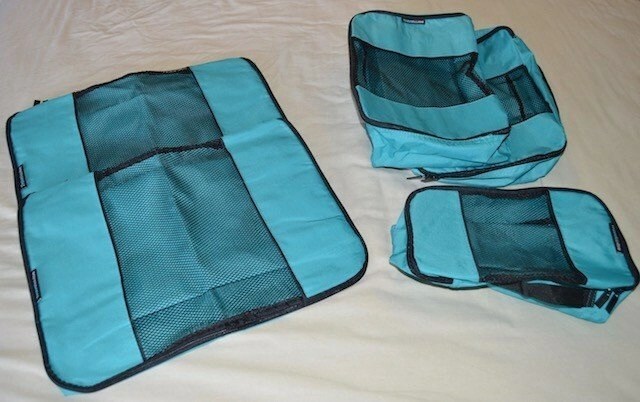 I have heard about packing cubes but am so glad to see your pictures and how they actually work. I am going to have to get some. I love these travel cubes. They make packing so much easier. I can actually fit my clothes that would normally have to go in a suitcase into a carry on bag with them! Great tips! I’d love to be better at packing. We travel so much but packing is always done the night before and it’s usually a big free for all in our suitcases! These packing cubes sounds really incredible! I also have the same concerns when packing. I also checked at home the weight of my baggage to prevent it. These are great tips. This is some advice that both my husband and I desperately need. We both pack way too much and too messy. 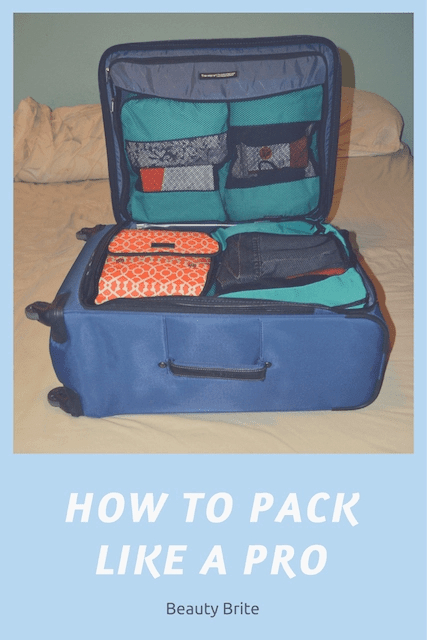 I’ve never been very good at packing but these are some great tips for packing like a pro. I love how you were able to consolidate everything in the suitcase.